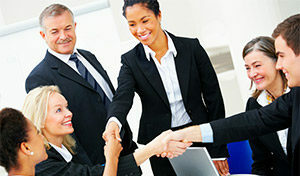 The collaborative practice of law is a way of practicing law whereby the lawyers for both of the parties to a dispute agree to assist the parties in resolving conflict using cooperative strategies rather than adversarial techniques and litigation. Early non-adversarial participation by the lawyers allows them to use attributes of good lawyering frequently not utilized in the usual adversarial proceedings—namely use of analysis and reasoning to solve problems, generation of options and creation of a positive atmosphere for settlement. Disputes involving families, divorce, businesses, partnerships, employment issues, healthcare, medical malpractice, construction, and probate and estate matters are areas of practice that can use the collaborative practice of law. While no two cases or collaborative lawyers are alike, the emphasis in the approach is to find a way in which the lawyers can work with the parties that will achieve a satisfactory settlement in an efficient, cooperative manner. This might include “four-way” settlement conferences where the parties meet with their collaborative lawyers to work on settlement. Basically, however, your lawyers are committed to finding ways to achieve settlement that will work best in your case. Their philosophy is that as much effort should be exerted toward settlement as is traditionally spent in preparation for and conducting a trial.